Pepe’s Cantina in Winter Park took over a space that used to be Mi Tomatina, a place that specialized in Paella in late 2015. Ever since then, Pepe’s has been a great success at the Hannibal Square location and has become a staple of good eats in Winter Park. Pepe’s has done so well in fact, that the owners decided to open a second location in Downtown Orlando at 120 W. Church street, adjacent to Hamburger Mary’s. Sure, they have Tex-Mex classics like enchiladas, chimichangas, tacos and burritos, but Pepe’s strives to be innovative with a menu that puts a new twist on traditional Mexican cuisine. Table side guacamole, tacos with authentic fillings and fresh homemade tortillas are great for lunch or dinner, but ordering off of the dinner menu is where the difference is. Pepe is a real person by the way, as in Chef Jose "Pepe" Baranneko. For dinner they serve entrees like Pollo Pepe’s a grilled chicken breast served with onions, peppers, tomatoes and bacon and is topped off with a signature red sauce and queso, or the Pacific Salmon topped with a sweet and sour mango jalapeno sauce. An interesting appetizer on the menu is the Shrimp Dip which is grilled shrimp with cheese dip, topped with pickled onions and cilantro. Of course any good Tex-Mexery should have plenty Tequila and Margarita specials on hand, and Pepe’s certainly delivers in that category. Guests can try a Spicy Mango Margarita, a Jalapeno Margarita, a Mezcal-Rita or just go straight for the good stuff and slam a shot of Avion Reserva 44 extra anejo for $26.00/shot. I haven't got to try out all there is at the new Church Street location, but we did stop by for lunch one day, and it was really good. Chips and Salsa are standard fare at any Mexican restaurant these days, but this salsa is made in house as well as the chips, and that’s what really makes Pepe’s so good. They focus on fresh. These Grilled Chicken Tacos were topped with radicchio, pickled red onions and cilantro then topped with a chive aioli sauce and are served with black beans and Mexican rice. You can choose flour or corn and soft or hard for your taco, and all tortillas are made in house. This is a Mexican Pizza. 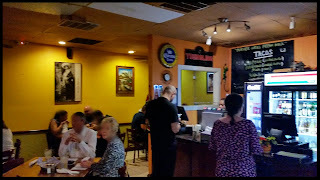 It’s totally not what you would expect, but that’s what Pepe’s really strives for...classic dishes, or even not so classic, like a Mexican Pizza, made with different ingredients, flavors and styles that you are not accustomed to. You can choose shredded chicken or ground beef, and they top it with red sauce, cheese, jalapenos, sour cream and cilantro and serve it atop a lightly baked tortilla. Stop by the new location and say Hola to Pepe. Chef Pepe and his team are doing a great job at both locations offering his signature blend of authentic Mexican ingredients with innovative culinary techniques. Central Florida’s wildly popular food truck serving fresh and delicious Mexican street food is celebrating the opening of their first brick and mortar location. Now all food lovers have even more access to enjoy the fresh and delicious tamales of the beloved Tamale Co. Food Truck whenever they want, now that “Tamale & Company Take Out” in Altamonte Springs. Customers of Tamale & Company Take Out will feel right at home at the 1,000 square foot quick service casual feel restaurant with a modern Mexican design. The location will serve all of the tasty tamales from the food truck, weekly special tamales and even more of a selection of the sought after Mexican street food. Patrons can dine inside at a wall bar or outside at select tables and chairs and enjoy the ease and convenience of “grab and go” service with delicious home cooked meals, a very popular concept in the Tamayo’s hometown of Mexico City. Tamale Co. Food Truck was founded in Orlando by Chef Fernando Tamayo and Jennifer Tamayo in December of 2012. They provide the people of Central Florida with an original and traditional assemblage of different flavors in gourmet Mexican tamales that fills the void between fast food and sit-down dining. Tamale Co. Food Trucks can be found serving at Famers’ Markets and making local food truck visits throughout Central Florida. Border Grill is what some of us might call a “Hole In the Wall” type of restaurant. With so many new restaurant openings over the past few years that have brought Orlando all kinds of great new and shiny dining experiences, it's actually nice to find a place that is very mom and pop and somewhat of a hole in the wall. Make no mistake though, what Border Grill lacks in size, they make up for in flavor. The menu here is traditional Mexican street food with some Tex-Mex offerings as well. Everything is cooked to order in the open kitchen towards the back of the restaurant with fresh ingredients and fast service with no frills. That is what makes this place so special. The Taco’s have become famous for those who have already found out about Border Grill. Taco offerings include, carnitas, shredded chicken or beef, seasoned beef tongue, chorizo and of course fish tacos. If tacos aren't your thing, they have a good variety of some pretty awesome burritos and enchiladas and a few other dishes and daily specials. Chips and salsa are complimentary, but we ordered a side of Guacamole and a side of Queso to get our dinner started. My guest chose the Trio Tacos with Carnitas. The pork was seasoned wonderfully and was topped with fresh cilantro and diced onions. All combos come with Mexican rice and refried beans. I really wanted to order tacos, but once I saw Milanesa steak on the menu, I had to order it, as it is one of my favorite things. Milanesa is a thinly cut, breaded and fried steak. The one at Border Grill is topped with fried potatoes and sauteed onions and has now moved into first place for my favorite Milanesa in Orlando. In addition to potatoes and onions, the dish is served with lettuce, tomato, Mexican rice, refried beans and your choice of three corn or flour tortillas. Sopapillas are popular dessert in a lot of Mexican restaurants. The deep fried pastry is usually served as a dessert, covered with honey or syrup and cinnamon. The sopapilla at Border Fresh is made for at least two people to share and is topped with chocolate sauce, honey, cinnamon and lots of ice cream and is a pretty fantastic dessert. This unassuming hole in the wall may be located in a suspicious strip mall on Vineland road, but Border Grill may be some of the best authentic Mexican food that I have had outside of Mexico itself. The staff is very friendly and our food was cooked to order and came out pretty fast. 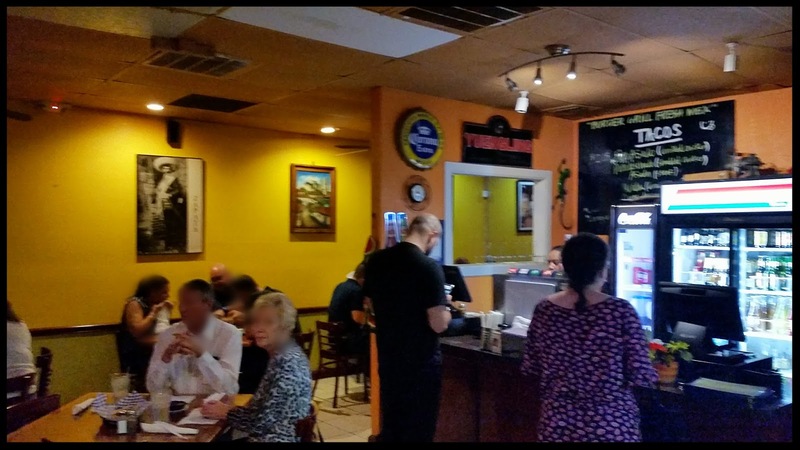 Stop by sometime and enjoy one of Orlando’s best “Hole In the Wall” restaurants….you will not be disappointed.